Hearing from patients and visitors that we needed more handicap spaces at Dartmouth-Hitchcock Medical Center (DHMC) in Lebanon, our Security team and Parking Committee looked at our available parking spaces and added more spots for handicapped parking. We continue to look at improvements we can make to our parking options by collecting feedback from patients and visitors. If you have ideas or comments on how to improve our parking at DHMC, please feel free to leave your comments below and we will pass them along to our Parking Committee! “We Hear You” is a series about, and for our patients and their families. Have you offered feedback or given us a suggestion to improve something and wondered if we ever acted on it? 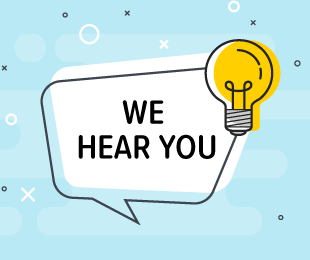 We want you to know that we are listening and to share what we are doing to better meet your needs.